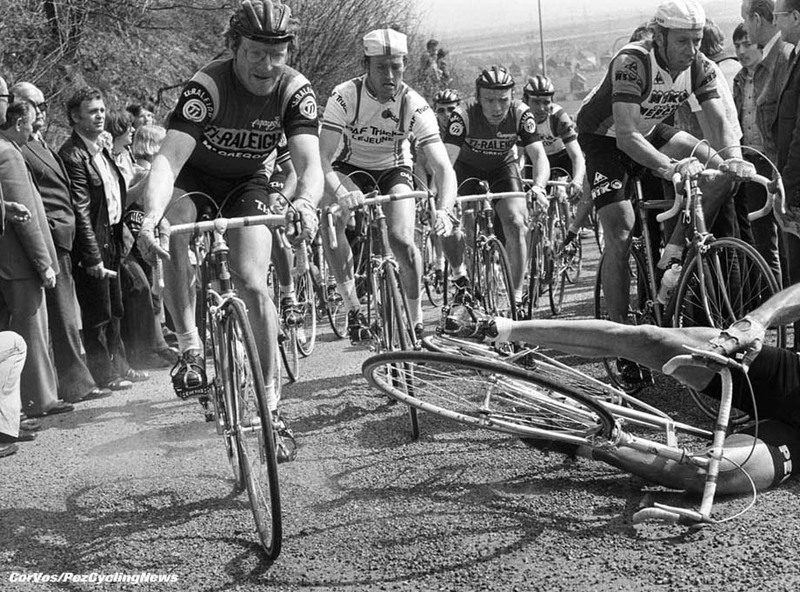 It's Gent - Wevelgem 1974; you've made it over the savage Kemmel climb twice with the lead group and survived hanging on the back of an Eddy Merckx (Belgium and Molteni) and Roger De Vlaeminck (Belgium and Brooklyn) driven purge on the run-in; there are 17 guys left, so maybe you would settle for a top ten? Not if your name is Barry Hoban (Britain and GAN-Mercier) and you feel that the 'over-drive' is in your legs. 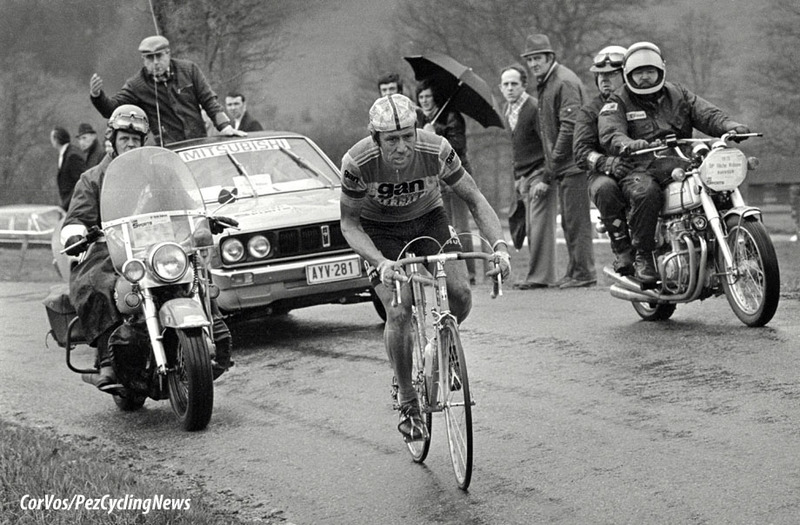 Perfect timing gave Barry Hoban the big Classic victory in Ghent-Wevelgem 1974. The Yorkshireman surprised a seventeen man star-studded group at the finish. Some of the World’s best riders were in the group: Eddy Merckx, Roger De Vlaeminck, Eric Leman, Freddy Maertens, Walter Planckaert, Walter Godefroot and Frans Verbeeck, but it was Hoban who took the spoils. 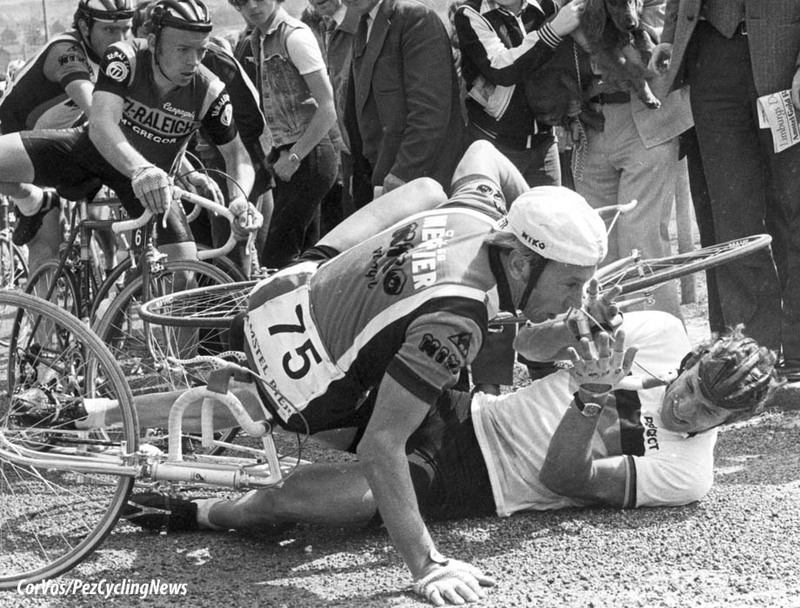 Merckx and Leman were sprinting for the line, the two riders took either side of the road, but it was Hoban who shot through between them. 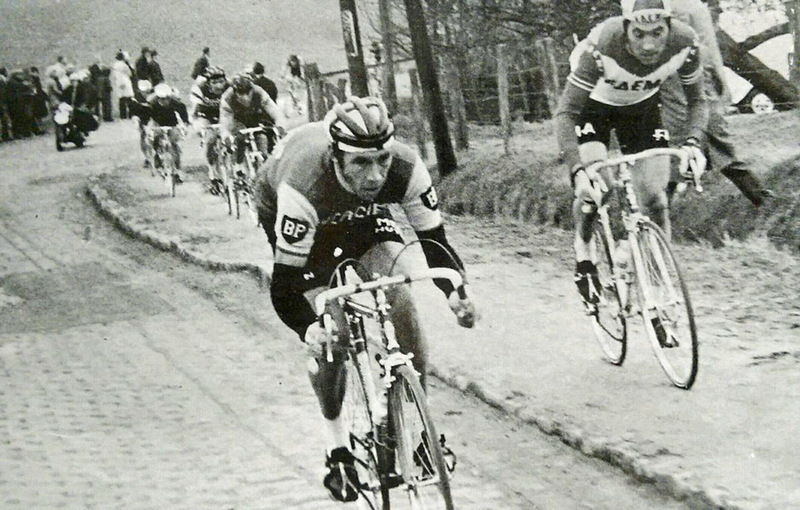 After failed attacks from Cees Bal and Patrick Sercu, followed by Merckx and Roger Swerts on the Kemmelberg, Roger De Vlaeminck came over the top of the Kemmel first. Frans Verbeeck tried his luck on the second climb of the Kemmelberg, the chase led by Merckx set up the winning move of Verbeeck, Hoban, Merckx, De Vlaeminck, Leman, Van Springel (MIC), Danguillaume, Esclassan, Rouxel (Peugeot), Swerts, De Geest (Rokado), Planckaert (Watney), Poulidor, Santy (GAN), Godefroot, Maertens (Carpenter) and Tino Tabak (Raleigh). 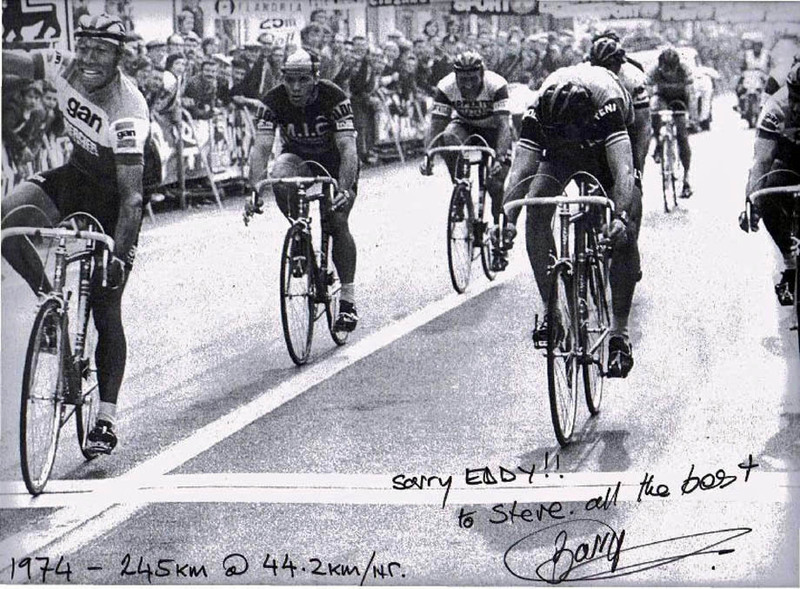 Barry Hoban takes up the story: "The race was different back then, it went further north up towards Holland before it ran down the coast from Ostende to De Panne. The early stages of a classic are a softening-up process and when we turned inland away from the sea towards the climbs the echelons started." "It was very fast, a lot of guys were eliminated at this stage and the only place to be was at the front. I had problems on the Kemmel, my gears kept threatening to slip out of my 42x22 bottom ratio and I had to try and climb whilst holding the gear lever." Hoban was riding a six speed screw-on block, levers were on the down tube there was no 'ratchet' or 'retro friction' facility, never mind indexing. "Once we were clear of the hills the road widened-out and Merckx, De Vlaeminck and Godefroot went to the front and drove very hard for ten kilometres, guys were getting shelled-out all over the place. I was hanging on in the string behind them but eventually they eased up and I made it into the echelon. That was really the race decided, no one was going to get back up. I could feel that I had the 'over-drive' in my legs. 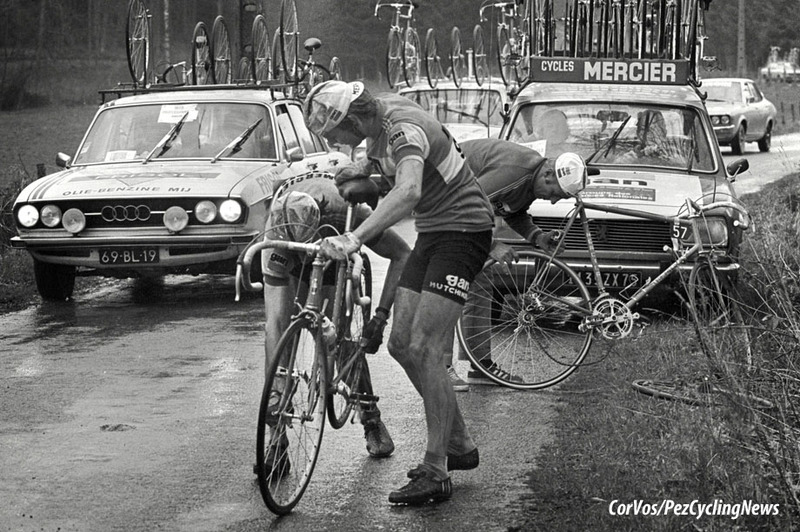 Merckx had it all the time, but mere mortals like me only felt it on occasion." "The attacks started and guys were going all over the place, Tino Tabak, Danguillaume and Van Springel all tried to get away, when it's like that you have to hold the wheel, you can't let the gaps open." 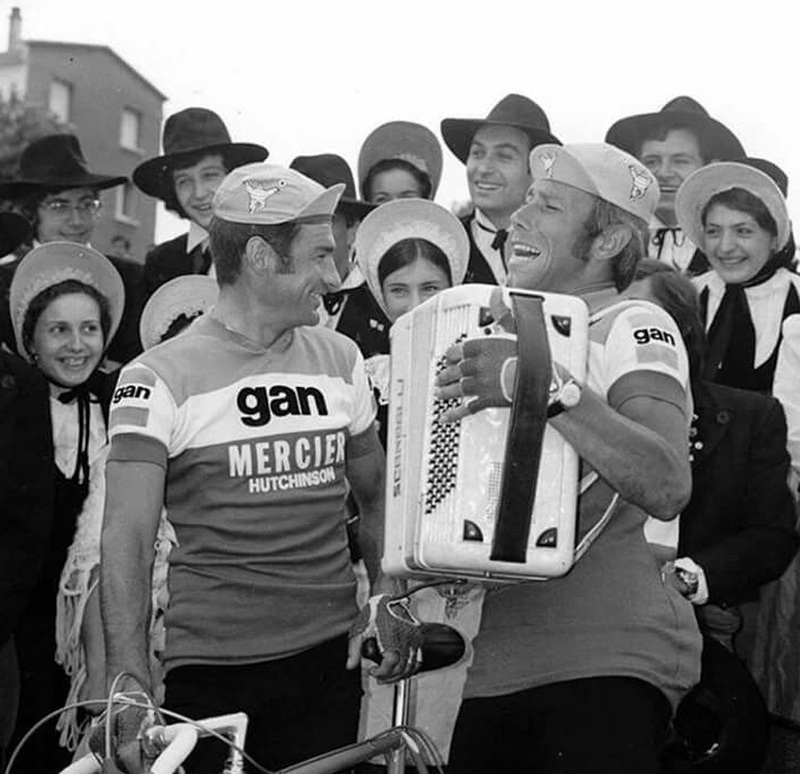 I ask him about the fact that he had two GAN-Mercier teammates in the break - Frenchmen Alain Santy and Raymond Poulidor, did they help him? "We weren't that organised and in the classics we all tended to ride our own races but Raymond did close some gaps for me on the run-in." 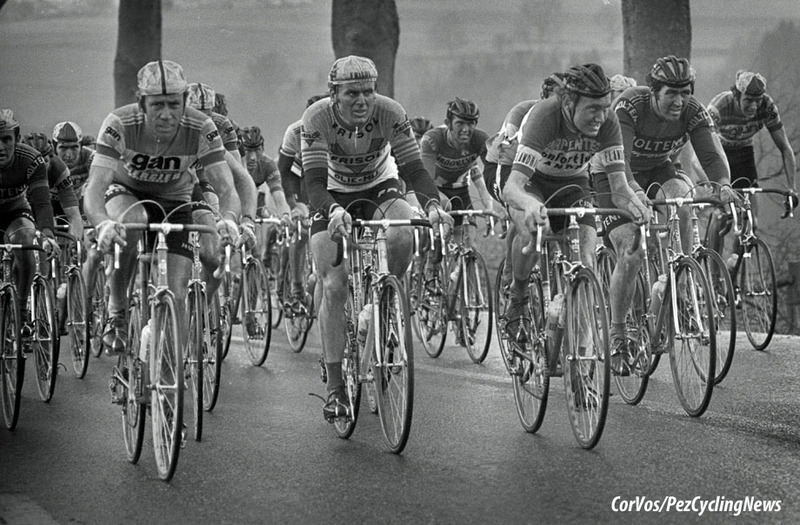 "I was boxed coming in to the finish behind Merckx, De Vlaeminck and Eric Leman. I was sitting there thinking about how I would get through, it always tends to fan-out towards the line and with about 150 metres to go a gap opened-up between Merckx and Leman - I went straight through it. 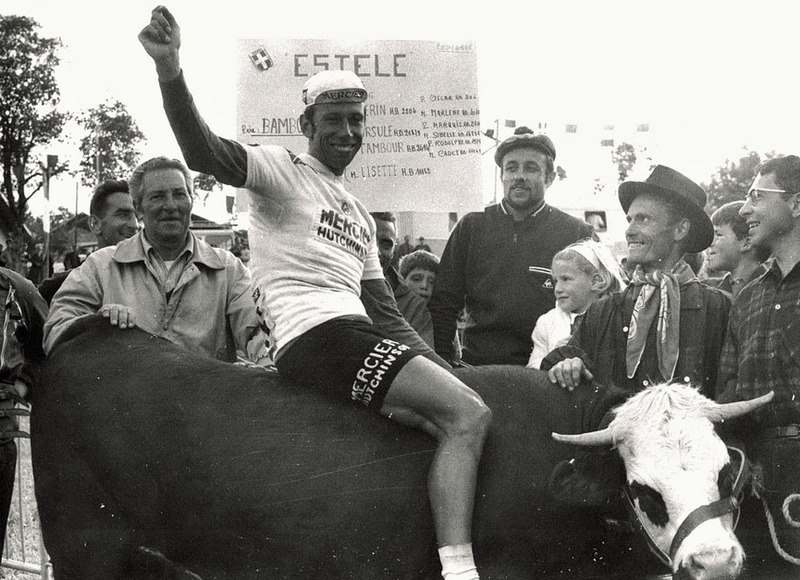 I had great legs and won by a length from Merckx and De Vlaeminck." In photos of the finish you can almost see the 'thinks bubbles' coming from the two Belgians heads; "Where the hell did he come from?" 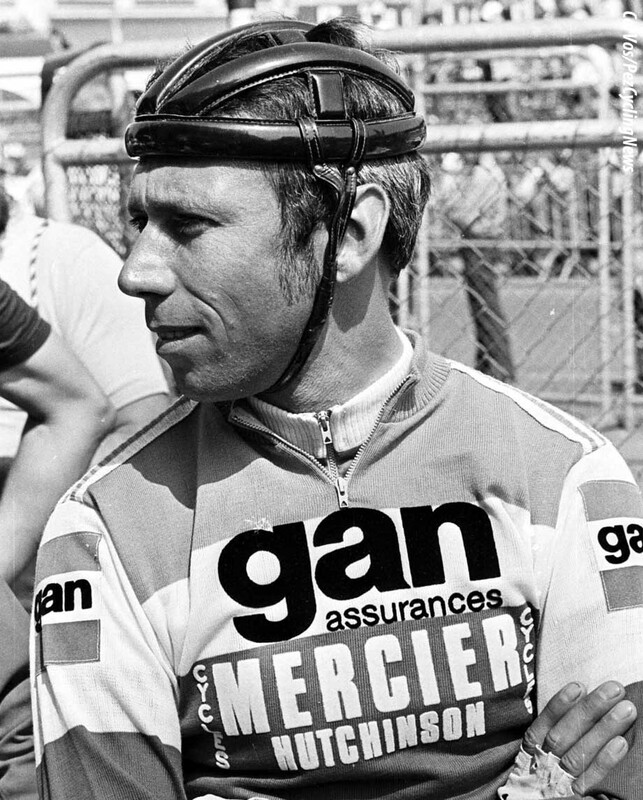 Merckx, never a good loser was moaning at the finish that he hadn't seen much of Hoban at the front, but the Yorkshire man was unconcerned; "I would have been at the front if I hadn't been for the problems I had with my gears. Eddy was a winner by nature and didn't like to be beaten." After his historic win, Barry Hoban gave his side of the race to British cycling magazine Cycling Weekly: "You must understand, I’m not usually in form so early in the season, I’m at my best most years in the summer, to be exact at Tour de France time; but this year I am going well, much better than in the other years. In the Catalan Week I worked hard for Bal and Zoetemelk, as they can tell you, and on the Sunday, in the Tour of Flanders, I would probably have been in the leading group if I had not punctured." "Still I suffered during this one, I can tell you, because I’m not yet in top form. On the climbs, especially on the Kemmel, it was like being on the end of a piece of elastic. I was dropped, got back on, dropped and back on, and so it went on. Fortunately there were no mad attacks at the time. The pace was certainly fast, but any attempts were soon sat on. If anyone had been able to go it alone I would probably have been left." Hoban managed to fight back to join the 17-man break. How did he see his sprint victory? "It was just the kind of sprint I like, 15 to 20 strong. I hate big bunch sprints. Remember, I have three children at home. Swerts started it with 500 metres to go, jumping hard, and Tabak went after him like a rocket. Behind them Leman and Merckx looked likely winners, flat out side by side, and I was behind them. I was wondering how I could get by them when suddenly, goodness knows why, they separated, the door was open for me and I went through." 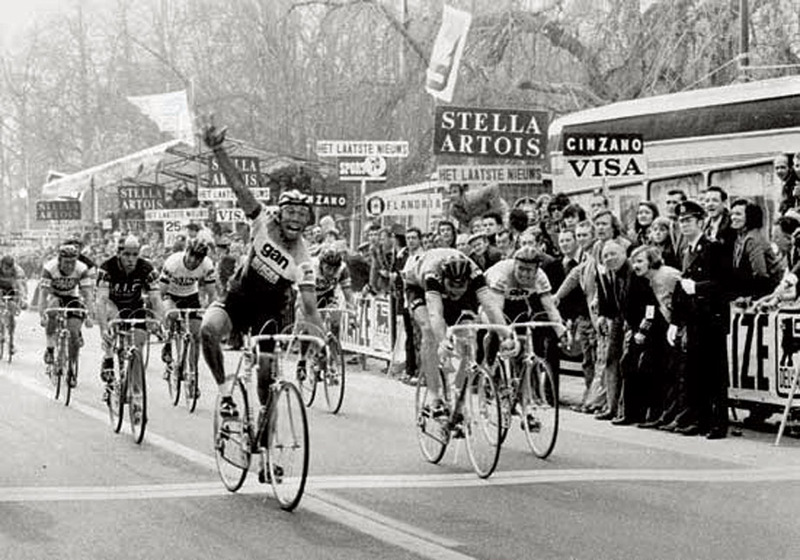 The riders that Hoban beat that April day in Wevelgem were the finest of the generation, Merckx is unquestionably the greatest ever with three world titles and, wait for it - two dozen classics; De Vlaeminck 's palmarès are huge too and include four Paris-Roubaix and three Milan-San Remo; Santy was fourth; fifth was Leman who won the Tour of Flanders three times and sixth was double world champion and Vuelta winner Freddy Maertens. Gent-Wevelgem, 2005: winner Nico Mattan, 208 km @ 42.577 kph. 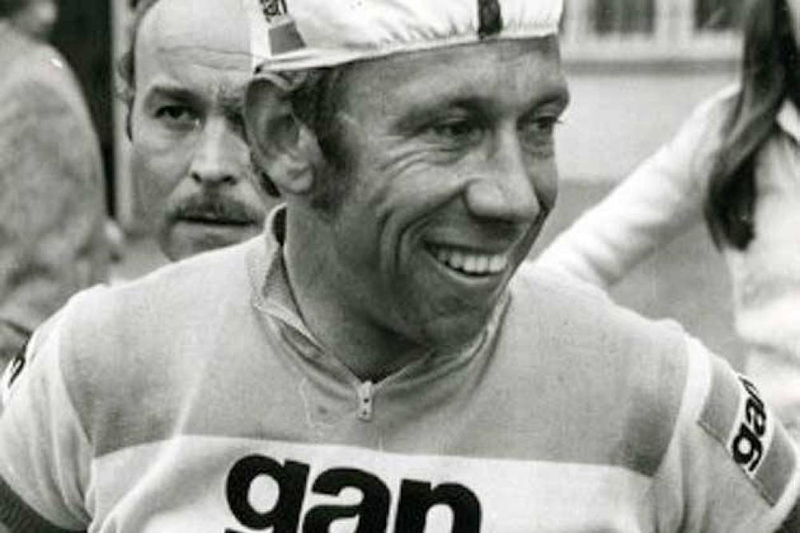 Gent-Wevelgem, 1974: winner Barry Hoban, 244km @ 44.383 kph. "I was a dangerous rider on my day", concludes Hoban.